In a myriad of breakfast options in India, eggs are very near to the bottom of the list. 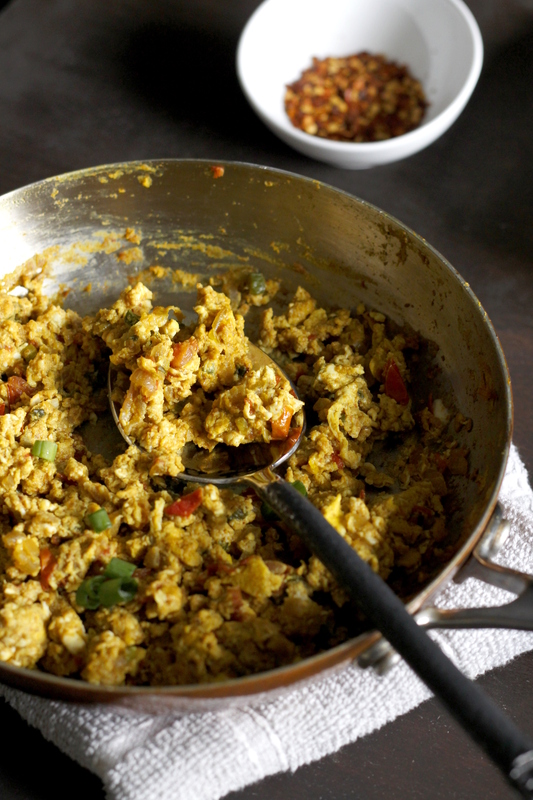 When eaten, eggs are typically for lunch or dinner in the form of a curry of some sort to accompany rice or rotis. Also, egg is considered non-vegetarian by many, and even with non-vegetarians it does not share the table on auspicious days (which is pretty much every day for some people!). My point is, the versatility of egg demands more occasions. And you would still never be bored of repetition. Just like music tunes, I don’t think you can ever run out of new ways to cook eggs. My favorite and simple way is to scramble them with some onions (or spring onions when in season) and few fiery chilies. If I am in the mood, I add few tomatoes. But the special ingredient is clove! !…crushed in a mortar and pestle along with some garlic if you want. That’s it! One clove makes a world of a difference. Clove or not, onions and chilies are a must. 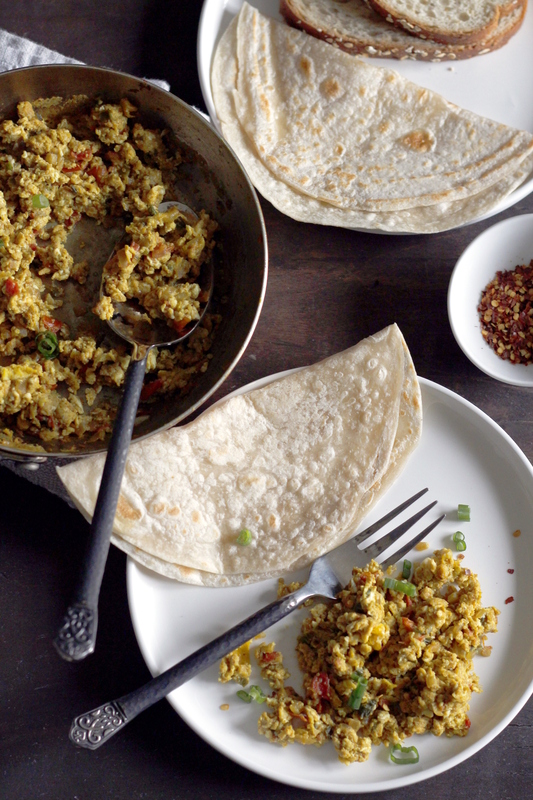 I may forget adding eggs to the egg scramble, but I would never forget onions and chilies. Oh, by the way, in our house we typically eat it with roti or tortillas as in soft tacos, or with rice, or with bread as in a sandwich. If no one is looking I will eat it straight out of the pan! Heat a wide non-stick pan on medium and add oil. Once hot add onion/spring onions and chilies. Cook for 5 minutes stirring occasionally until they start turning golden brown. Crush the clove and garlic in a mortar and add that paste to onions (It will be a scant amount…so you can use a splash of water to get that out and add that water to the onions). Add diced tomatoes if using, and add salt and red chili powder and turmeric. Cook until the tomatoes turn mushy and moisture is gone ~3-4 minutes. Spread the mix on the bottom pf the pan and crack 4 eggs into it. 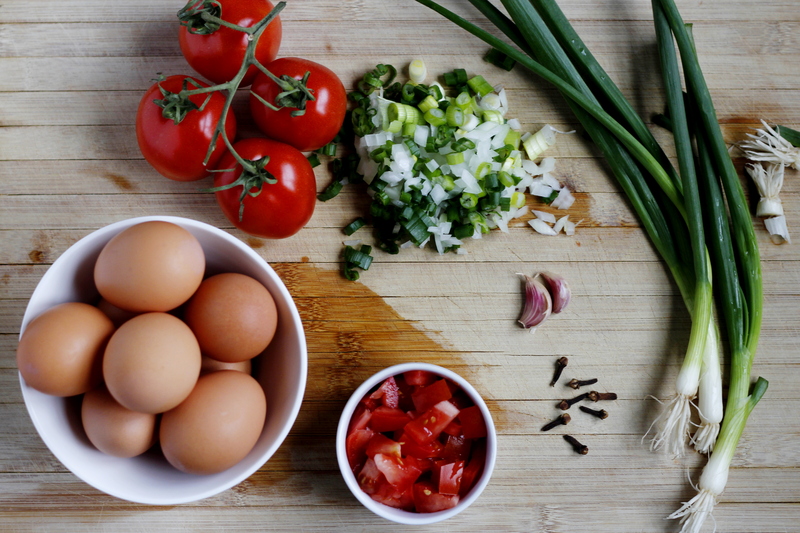 Let them set slightly, break the yolks and scramble them with a spatula to mix everything. If you prefer big chunks, stir once in a while until the eggs are not runny. Turn off the heat and eat in whichever way you prefer!